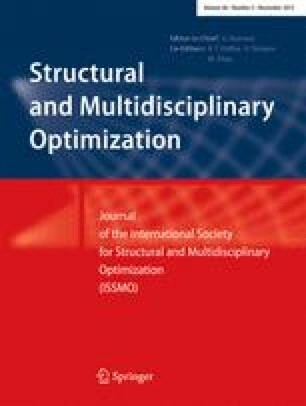 The purpose of this paper is to apply stress constraints to structural topology optimization problems with design-dependent loading. A comparison of mass-constrained compliance minimization solutions and stress-constrained mass minimization solutions is also provided. Although design-dependent loading has been the subject of previous research, only compliance minimization has been studied. Stress-constrained mass minimization problems are solved in this paper, and the results are compared with those of compliance minimization problems for the same geometries and loading. A stress-relaxation technique is used to avoid the singularity in the stress constraints, and these constraints are aggregated in blocks to reduce the total number of constraints in the optimization problem. The results show that these design-dependent loading problems may converge to a local minimum when the stress constraints are enforced. The use of a continuation method where the stress-constraint aggregation parameter is gradually increased typically leads to better convergence; however, this may not always be possible. The results also show that the topologies of compliance-minimization and stress-constrained solutions are usually vastly different, and the sizing optimization of a compliance solution may not lead to an optimum. This research was supported in part by the Ontario Graduate Scholarship program. The computations were performed on the General Purpose Cluster supercomputer at the SciNet HPC Consortium. SciNet is funded by the Canada Foundation for Innovation under the auspices of Compute Canada, the Government of Ontario, the Ontario Research Fund—Research Excellence, and the University of Toronto.